Ryuichi Fujimura, Jonathan Sinatra, Alice Cummins. Video still: Ryuichi Fujimura. MARTHA GRAHAM WROTE, VERY BEAUTIFULLY, “TO UNDERSTAND DANCE FOR WHAT IT IS, IT IS NECESSARY WE KNOW FROM WHENCE IT COMES AND WHERE IT GOES” (MARTHA GRAHAM, PRINCETON UNIVERSITY PRESS, 1966). Some theorists, such as André Lepecki, make a big deal out of the melancholy of the dance critic, imbuing the experience of writing about movement with a sense of loss (however unintentionally) that I have always found melodramatic. But the question of remembrance is related to culture, to fashion, to fame, to legacy and as such is more interesting to the critic and to the choreographer than to the dancer. To dance is to revel in the now. Dance improvisation has to be understood as something very different from finished choreography. Choreography is to movement what a play is to stage presence: a set of directions, located outside particular time and space; universal and thus generic. Says William Forsythe: “The purpose of improvisation is to defeat choreography.” All the arguments made in Performance Studies, in favour of presence over representation, apply. To witness an improvisational dance performance requires the observer to look beyond the movement itself. It cannot be judged as choreography, because it is deeply unrefined, unedited movement: at best serendipitous, often cacophonous. To watch improvisation is to watch a performer shed layers of performance until, if lucky, we are left with a body moving as if for the first time; a raw and vulnerable, unpredictable life; pure presence. As Paul Romano, one of the Little Con organisers, says, “Improvisation is living amplified.” In that sense, improvisation is more thoroughly dance than any other kind. At The Little Con special, the audience sits in a cross-shaped line of chairs, dividing the performance space into four rectangles, each with a different ‘curator.’ The one closest to the entrance is animated from the start: Fiona Bryant and Lucy Farmer are engaged in frenzied movement anchored in a recognisable social reality, like over-caffeinated secretaries. At five-minute intervals, other rectangles join in. After an hour, they similarly fade out. Different quadrants expand on different areas: Bryant and Farmer present a poppy, humorous and very accessible exploration of states under pressure. Tony Yap and his two dancers, on the other hand, explore both ritual movement and voice, using the tools of the Malay shamanistic trance dance tradition: singing on the very border of inarticulation accompanies movement. Peter Fraser, whose background is in Bodyweather, and his three dancers, work strongly as a cohesive team of bodies, splattering across the walls, chairs and floor of their quadrant, but always extraordinarily attuned to each other’s presence. In this wealth of movement around me, literally around me, I am only vaguely aware of what is happening in the last rectangle, occupied by Alice Cummins, practitioner of Body-Mind-Centering®, and collaborators. As they increase, some collisions are very satisfying: Cummins’ presence electrifies the interrelations of Fraser’s quartet. Some are more disruptive of the precarious balances created. There appear at least glimpses of every pitfall of improvised performance: competition for attention, imitation as a means of achieving a semblance of unity, a certain aloofness as a vehicle for comedy. But interaction is sometimes hilariously consonant: as Tony Yap delivers a long, focused shamanistic gargle of sorts, Fiona Bryant, in a red dress, with scissors and shoulder pads, climbs on a chair and starts screaming in response. The key to it all is the extraordinarily heightened presence of the performers, and the accordingly sharpened concentration of the audience. Since the movement cannot be predicted, there is no arc to any gesture. Except for the final 15 minutes, the absolute absence of structure creates an experience without horizon. Much of the joy comes from watching audience members respond with great focus to interaction that they cannot anticipate the ending of: two boys slowly leaning to one side of their chairs as Farmer appears to be attempting to walk over them. In another moment, Cummins shifts across the floor, but ends up thoroughly immersed in picking through my frilly skirt. Only once it is over do we notice that the space has assumed the temperature and humidity of a Turkish bath. It has been an exhausting, exhilarating hour. There is simply no melancholy to this experience, no sense of loss. As Martha Graham elaborates, the dance comes from the depths of man’s inner nature, and inhabits the dancer; when it leaves, it lodges itself in our memory. In The Little Con, this trajectory is revealed on stage from slow start to exhausted end. The mystery of the choreography, a finished thing which appears out of nowhere and is gone, is something quite different from movement that rises like a roar from the core of the dancer, levitates suspended and then slowly closes onto itself. These have been some of the most intensely focused minutes I have had as a performance audience, not unlike trance, or meditation. Who would have thought that our concentration span could be so long? 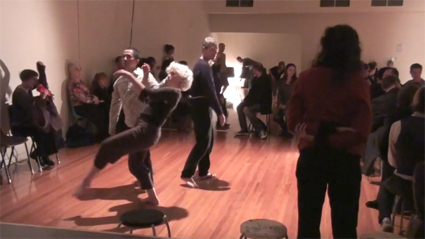 The Little Con is a monthly dance improvisation organized by a dedicated collective since 2005. It is hosted by Cecil Street Studio, the home of Melbourne’s improvisation community, but has also appeared at Deakin University and elsewhere. Sometimes it is free form, but throughout the year there are special, curated events, such as this one from curator Paul Romano. The Little Con, curator Paul Romano, performers Emma Bathgate, Brendan O’Connor, Tony Yap, Lucy Farmer, Fiona Bryant, Peter Fraser, Kathleen Doyle, Alexandra Harrison, Jonathan Sinatra, Gretel Taylor, Alice Cummins; Dancehouse, Melbourne, Aug 6, www.thelittlecon.net.au. First published in RealTime, issue #104, Aug-Sept 2011, e-dition.